Kate lives in Pembroke, NH with her husband and her son, Spencer. Her family also includes 3 dogs and 2 cats. Since she was a little girl she had always wanted to work in the veterinary field and that is exactly what she did. Kate has great passion for making the lives of animals and their owners better. Tracy joined the PAH team in August of 2018. Her compassion for pets of all ages and their human family makes her a great fit as a client service team member. Her furry family includes 4 cats, a Shih Tzu cross and a ferret. Karen earned her Animal Science degree from UNH, she also lived and worked year round at the horse farm on campus. During her college career she competed in 3-day Eventing. One of her greatest joys was retraining her thoroughbred racehorse herself. 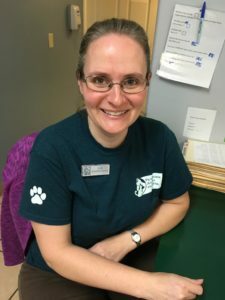 Though Karen was a veterinary technician for ten years, she is very enthusiastic being a receptionist on the Client Service Team. From hatching chickens in her kitchen to raising many dogs and rabbits, all aspects of farm life interest her.